Help Create a DRM-free Ebook Lending Social Network. Contribute to the Our Bookshelf Indiegogo campaign. A few months ago I wrote a guest post here that touched on some of the barriers to sharing ebooks legally. In that post I talked about my plans to create a DRM-free ebook lending social network called Our Bookshelf. I have designed the website and I now have a great developer lined up to build it. However, good programmers and graphic designers don’t work for free. So I have launched an Indiegogo campaign to help raise the funds. You get neat perks when you contribute. More importantly, you will help create a place where people can share ebooks as easily they share print books, but in a way that still treats copyright holders fairly. Greg Belvedere is the founder of Our Bookshelf, the DRM-Free ebook lending social network. Are you seeking to make improvements and changes to your library on a small budget? Is your library looking to renovate, relocate, rebrand, or introduce a new service/program? In this DIY-style workshop, you will learn to how use people-centered design methods at your library to help you plan, coordinate, assess and evaluate your services and processes to ensure that they are cost- and time-efficient. While you may not have the staff, time, or funding to do a full-fledged library usability and user experience study; together, participants will experience how to use these methods to make small changes for a big impact. Filled with examples, case studies, and activities, participants will leave this workshop with the framework and tools for completing their own DIY usability study. We spoke at the annual SLA@Pratt Skill Share Fair on Leadership and Career Development for the New Information Professional. This is our third time participating in the annual Skill Share, check out our presentations from previous years. We speak on a range of topics, including leadership & career development (i.e. 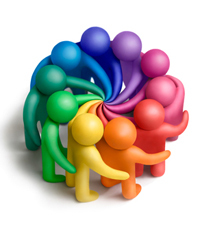 e-portfolios), unconferences and people-centered usability. Contact us for more info. What better way to network than breaking bread over the table together. Check out Grubwithus, a new type of networking that happens around the table. View your city and see what social dining events are happening or even start your own meal. 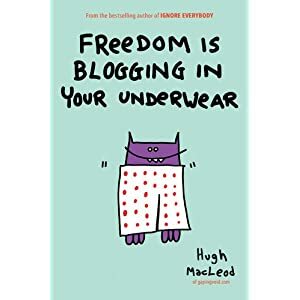 One of our favorites, Hugh MacLeod (author of Ignore Everybody), is coming out with a new book: Freedom Is Blogging In Your Underwear. Just added it to our to-read list.